.by Robin Tomlin Rakes on Friday, March 18, 2011 at 3:02pm.Mike is in surgery now. They are fixing the bottom tibea break which is actually right below his knee. That are also putting in the trachia- which should not be permanant. Actually- I can say it wont, but of course the medical staff cant say that. He has been breathing on his own during the day with very little, if any, assistance from the vent. I *think* they will still leave the vent in for a short time to be sure the trac is working like it should. They have also taken him off the tranqualizing medicine, so he is opening his eyes, wiggles his toes, & squeezes your hand. Unfortunatly his left side isnt doing much- his right side is doing much better. But thats what rehab is for!! We are all getting a chuckle out of the fact that he responds to women, and not much to me & not at all to his male nurse. Wonder why! I think he just auto tunes me out like at home! Unless he has a change they probly wont do anything about the bleed & bruising in his brain. NO change means its okay. Nothing on the jaw either. And of course until he can sit up they cant put the back brace on for his spinel injury. Now how hes supposed to sit up with a broken spine I havent figured out. Of course I thought it odd that they didnt realize until they went to put the brace on that they couldnt do it with him laying down. Duhhhhh.... seems like they would have realized that he isnt able to sit up being in a drug induced coma. Kelsey & Bella have been here with me. I stayed with Mike til they ran me off to get him ready for surgery. Bella needs her nap so Kelsey just took her back to the Vineyard. Yes- I ate, & I am okay. I am so grateful to have Kelsey here with me. There is really not much else to report at this time. This time last week we were sitting in this same room waiting for any news on Mike & his condition. Its amazing how much our lives are changed, forever. Please keep the prayers coming. Thanks for everything & I love yall!!! I love u! And I am so thankful that bella and I can be here with you. It makes me feel like I'm doing something to help even though I know there isn't much for me to do as far as dad. I actually think he helps me more than anything. He gives me hope! You are amazingly strong and I know all this is making our little family stronger! You have done a excellent job keeping us informed. I have read posts from you every morning, copying them e-mailing to work and sending out trying to help keep people informed. I have loved FB because the correct information is written by you and passed along. Great work Robin, know that all of you are in our thoughts & prayers!!! Keep the faith, you are staying strong and it shows!!!! Hi Robin. Kathy let me in on her Facebook page so I could check in on Mike's condition. He will be in our thoughts, as will you. Kathy will put both of you on the YMCA Middle Tennessee prayer chain. Please tell him Fred and Kathy Wegener are rooting for him to make a full recovery! Time: ‎9:00PM Tuesday, March 15th..
.by Robin Tomlin Rakes on Thursday, March 17, 2011 at 3:22pm.Sorry- never made it back on last night. After the hospital visit, & Kelsey & I getting our stuff organised here at the Vineyard, & trying to get Bella to sleep, I just wanted to sleep. And there aren't any real changes. BTW- before I forget again- if by some chance you would like to visit him- He is at Sacred Heart Hospital on the Gulf in Pensacola. For now he is on the Adult Critical Care unit. Anyone can visit as long as you come during visiting hours... 9:30- 10:30 am, 12:00- 1:00, 4:00- 5:00 & 8:30-9:30 pm. He is in bed 6 on the 2nd pod (I think)... & you have to be on elevator C to get there. If I vere off slightly- I am lost!! They have him off the meds that made him coma like- just some strong pain meds. They keep him pretty well knocked out but he can still respond to some requests. And he can have & show pain as Kelsey found out when they were working on his trachiak & making him cough- cuz he squeezed the stuffing out of her hand when the nurse did it. From everyone I have asked they say this is a normal response. Today they are putting ina pic line. The pic line is to take the place of a IV that is in his neck. His numbers aren't quite right infection wise, & apparently the neck IV is a common site for infections to start. As a precaution they want to change it. As soon as they see the pic line is working they will remove the IV. Tomorrow they will be doing 2 surgeries- inserting the trachea & working on his knee. Apparently it isnt the bottom leg that was broke, its around the knee. They are happy with the amount of swelling that has gone down. They aren't sure if he has an infection as the silly labs come back different. But they are doing what is needed as a precaution. I think I am going to try & squeeze in a quick nap before the next visiting hour. I have other things to do- but I don't feel like dealing with it right now. bad girl. Oh- I also wanted you to know that writing this almost daily, is good for me, & also there will come a time when Mike will want to know everything. Also- I am attaching a picture of the car- so you will realize what we know- he is a miracle man! I could not believe he lived thru this. 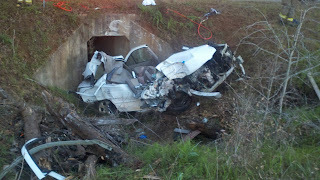 The crew did do a lot of damage to the car to get him out alive, but most of what you see is from the accident. Brad & I went & checked the accident site & went to the towing place to get any perrsonal things we could get out of whats left of the car. For me it wasnt near as bad of an experience as I expected- because it didnt even resemble a car- much less Mikes. This is where the car ended up after hitting2 trees & we think spinning into the culvert. I have some photos of that still on my camera that will show how deep it is. Love you for caring & please keep the prayers coming & ask your special Guardian Angels to give Mike a visit.